Virtually everyone on this blog will be familiar with the objectives of the Coudenhove-Kalergi Plan. It’s knowledge that we can put to good use in the right circumstances. To do so we need to be able to demonstrate three things. First the broad outlines of the plan itself. Second the fact that the Plan attracted major financial and political support – it wasn’t just someone’s plan. Third that implementation of the Plan’s recommendations started shortly after WW II and continues to this day. All three components are essential in making our case. The plan proposes to miscegenate Europeans out of existence and replace them with European/African/Asian hybrids. ‘The man of the future will be of mixed race. The races and classes of today will gradually disappear due to the elimination of space, time, and prejudice. The Eurasian-negroid race of the future, similar in appearance to the Ancient Egyptians, will replace the diversity of peoples and the diversity of individuals.’ Can’t be much clearer than that! Kalergi* makes one exception to this mixed-race fate: Jews. ‘Instead of destroying European Judaism, Europe, against her will, refined and educated this people, driving them to their future status as a leading nation through this artificial evolutionary process. It’s not surprising that the people that escaped from the Ghetto-Prison, became the spiritual nobility of Europe. Thus, the compassionate care given by Europe created a new breed of aristocrats.‘ Kalergi makes clear that this ‘new elite’ will rule over the dumbed-down mixed-race helots in a supposedly benign but fundamentally undemocratic system. 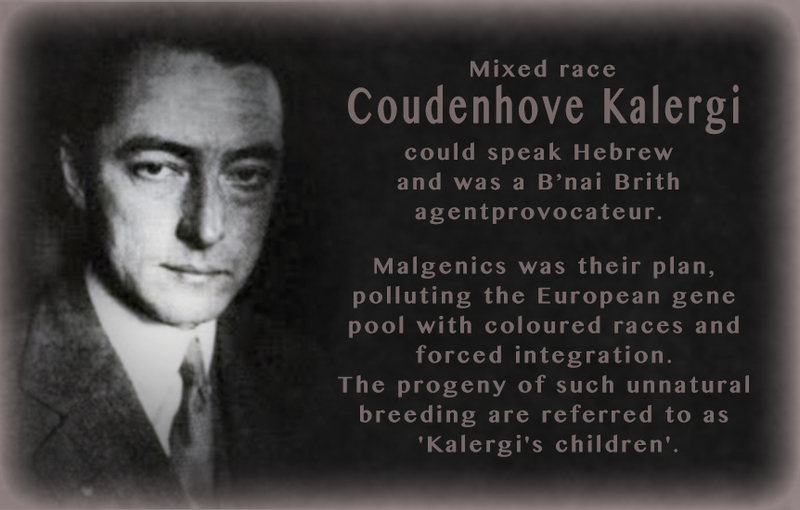 (Count Coudenhove-Kalergi himself was not Jewish but his main benefactors and two of his wives were). A good summary of his plan be read here and is strongly recommended. From the very outset Kalergi attracted support from massively wealthy and powerful Jews. Baron Louis Nathaniel de Rothschild became his personal friend and introduced him to mega-bankers Max Warburg who in turn introduced him to extravagantly wealthy Jewish financiers Paul Warburg (Max’s brother), Bernard Baruch, and Baruch’s brother Felix. These connections provided lavish funding and political support to Kalergi on an ongoing basis. Such support inevitably lead to practical results and, capitalising on the carnage of WW II the plan’s sponsors began to change the face of Europe and other White countries. 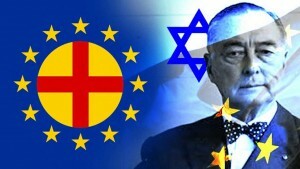 The Charlemange Prize, often referred to as the Coudenhove-Kalergi Prize (although as the goyim awaken this association is being downplayed) became Europe’s most prestigious, and, straight from the Orwellian playbook was awarded ostensibly to the person who did most to ‘promote European cohesion’. Not surprisingly the Count himself was the recipient of the first Award in 1950. Subsequent winners represent a rogues’ gallery of nation-wrecking traitors including Churchill (presumably for his efforts in destroying Europe during the war), Kissinger, Blair, Clinton, Merkel, Trichet and the current Pope. Since that first Award tens of millions of brown and black invaders have flooded all over the White world, rendering vast swathes of it unrecognisable from what they’d been less than fifty years earlier. And, spurred by an endless barrage of propaganda, the miscegenation project is in full sway, with Kalergi’s mystery meat everywhere we look. Meanwhile our Jewish puppet masters pull the strings from behind the curtain. This is powerful stuff. Provided we can get it out there among the general public. Which is where the Elevator Pitch comes in. But how can we possibly compress it into a meaningful and convincing pitch that lasts about half a minute? Well here’s my first cut. “Did you know that the whole EU project is based on a plan originally drawn up in the 1920s by a Japanese-European Count? He said that the European man of the future would be of mixed White, African and Asiatic race ruled over by a Jewish elite. The proposals attracted massive financial and political support from powerful Jews and the EU from its beginning directly follows the Plan’s proposals’. In itself this will not convince anyone. But the objective is to lead people to further question the Ordained Narrative. You’ll notice that I downplay the Jewish role for the Pitch. Remember that White goyim have been brainwashed to the point of altered brain chemistry when it comes to the JQ. It must be introduced with care. *I suggest shortening the Count’s full name to Kalergi in general conversation. Brevity is the essence of the Elevator Pitch!